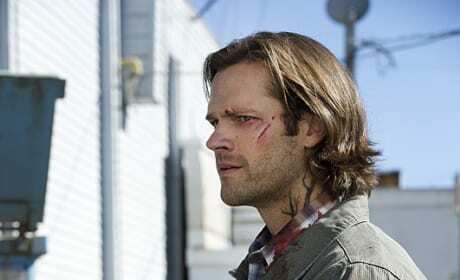 Sam seems eager to make a change, and that means not killing an infected human. He certainly looks wary here, but perhaps he can find a cure soon? This might wind up being a bloody showdown soon enough for Sam. Sam still probably hasn’t told Dean that he has been infected. And that neck tattoo is not making him look like he’s getting better. Maybe he can find a cure by capturing one of the infected? It seems the Darkness has continued to infect others, and this poor guy looks more confused than enraged. 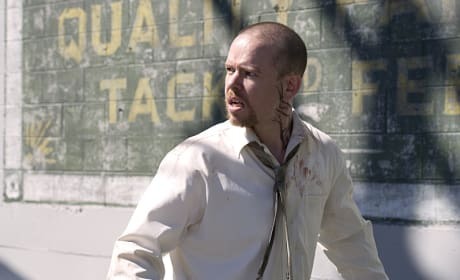 Might he be one of the people Sam can save with a cure? Or is he doomed to die in a matter of time. OK. Seriously. Someone needs to help Castiel out. It seems like things are getting worse and way more bloody. 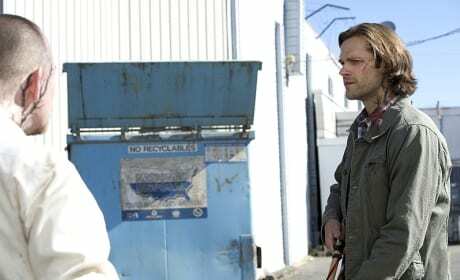 Sam and Dean need to help their angel friend and fast! Castiel’s call to his brothers may not have been the best move. His angel sibling seems far more ready for torture than forgiveness. This isn’t Castiel’s end, is it? He’s got to don the trench coat again! 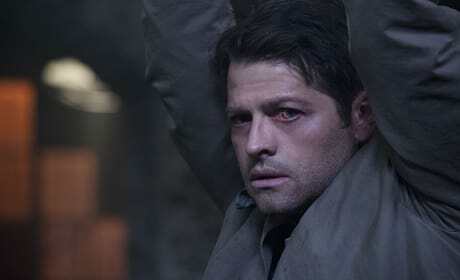 From the looks of it, Castiel could use a hug right about now. Rowena’s magic spell sure did a number on him, and hopefully his angel pals can get him back to his regular self. That sad look is just not going to cut it. These angels just want to chat with Castiel, right? Chaining him up doesn’t quite seem like the best way to start a party, but perhaps they’ve got a special technique to help their winged pal out. We hope. 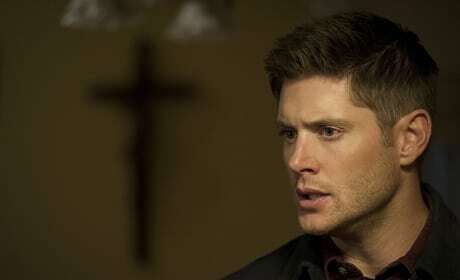 Dean sees something that bothers him. He’s got such a serious face on. Is it the Darkness? Is it an infected? Or is he just patiently waiting for some fresh pie? Deputy Jenna looks safe and sound after her escape from the infected at the hospital. Is that her mother cooking something up? Maybe it’s some pie for Dean after her helping her get to safety. Crowley as a priest is just so wrong. And it seems he’s been “helping” out Jenna’s mother. But why? Is he here to help battle the infected or does he have info on the Darkness? Or does he just want to cause a little havoc where Dean is staying? 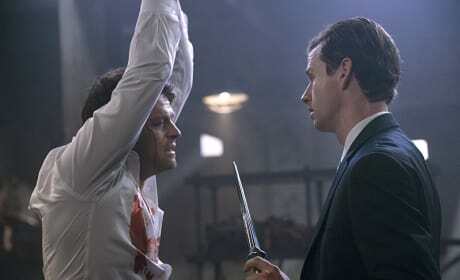 Would you confess your sins to Crowley? 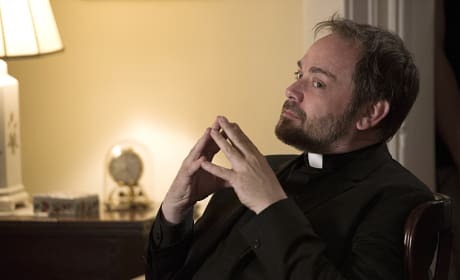 It looks like the King of Hell is pretending to be a priest, and he probably has a crafty plan up his sleeve. Let’s just hope it’s not taking any souls! 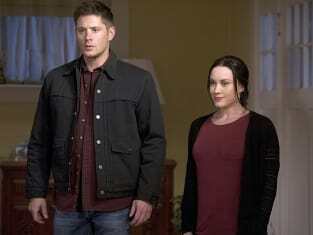 Dean and Jenna have vastly different expressions on their faces here. Who are they meeting? 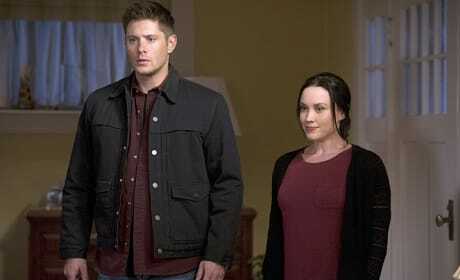 Jenna looks content, but Dean, he seems surprised. It has to be Crowley getting into the mix, right?